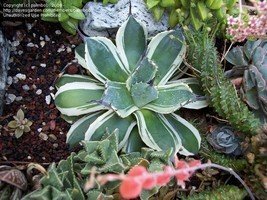 As I began to think about all my favorite succulents in my collection, I began to realize that a large proportion of them are the variegated ones. 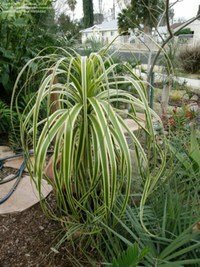 Just about any plant can potentially have variegation, and in many this feature denotes one of genetic weakness or a viral infection. 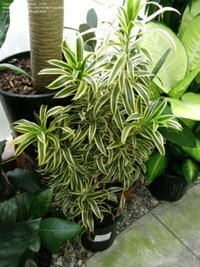 However in many others variegation almost seems to be the norm and these plants are incredibly hardy and resilient landscape and potted plants. And they look great, partly because they look different, but mostly because the multiple colors are often more attractive than the single colors. 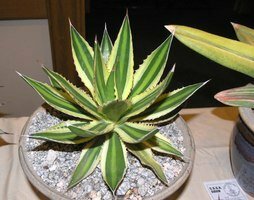 This article covers some of the more common and spectacular of the variegated succulent plants in the Agavaceae and related families that are available in cultivation. 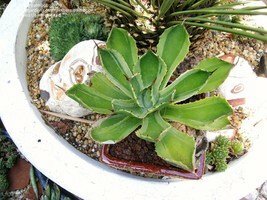 This is not an article about one-of-a-kind freaks of nature, but about the common variegated plants, many which one might find at most nurseries selling succulent plants... and some a bit more rare. Variegation in succulents is almost always caused by normal genetic variation, at least initially... once this mutation occurs, they are selected for and magnified in the cultivation process. 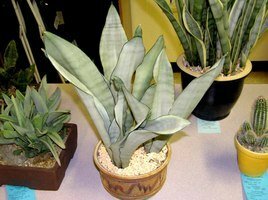 Most variegates in the wild would probably be eliminated due to the tendency for the variegated tissues to be naturally ‘weaker' and more prone to insect attack, sun damage, lesser ability to photosynthesize in low light situations (and hence become weak and die) and infection from fungi and bacteria. 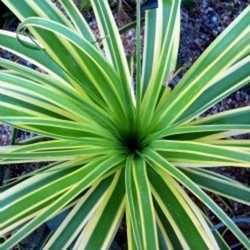 But in captivity, under the right environments, or protected from evolutionary pressures, many of these variegated plants perform beautifully and make excellent landscape and potted plants. 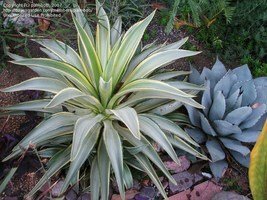 The agaves and related succulents seem to be well over-represented in the variegation department with some even having ‘natural' variegation (as seen in the wild). 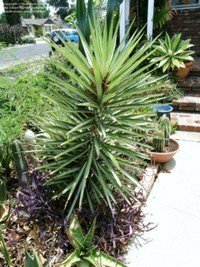 Most of these plants are amazing tolerant of full hot sun and other weather extremes making them exceptionally valuable as striking landscape specimens as well as great potted plants. 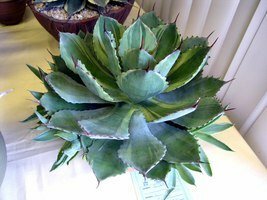 The following is a brief discussion of some of the more common and spectacular agaves and related plants I either have in my own collection or have seen on a number of occasions in other collections. 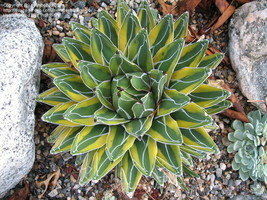 One of my favorite of all succulents is the variegated version of Agave attenuata. 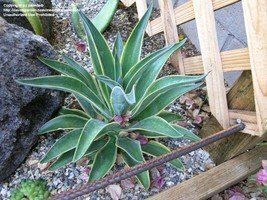 This is an amazingly hardy plant and takes full sun well, though perhaps would appreciate some protection from hot afternoon suns in super arid desert climates (but I have not really found that to be a big deal). These plants are pricey, but easy and carefree, so probably worth the cost. And the variegation changes throughout the year. Suckers often are also variegated, but many plants will produce non-variegated suckers as well, and if left on the plant, these stronger non-variegates will often ‘take over', growing faster and more vigorously than their variegated counter parts... so best to remove those as they appear. The variegated version of this species seems a bit more sensitive to cold than the non-variegated and blue versions, though all are pretty wimpy when it comes to cold. 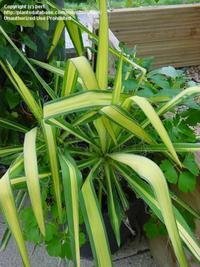 There is a smaller, fairly weak and only barely variegate plant called Kara's Stripes or Lime Green, and it has subtle variegation in a striped pattern down the leaves. 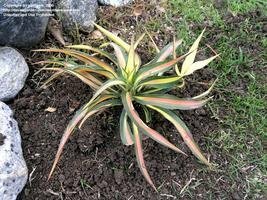 This is a slow growing plant and has little full sun tolerance. 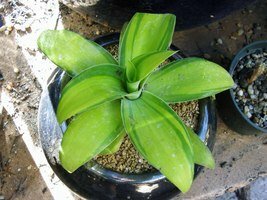 Grow this one in shade or morning sun. 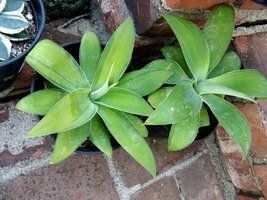 My own Agave attenuata variegate showing how it changes from season to season... it never looks the same... great landscape or pot plant! 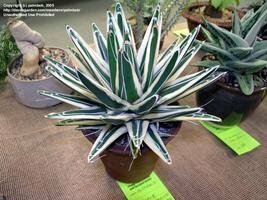 Agave americana has several variegated versions that are common in cultivation. 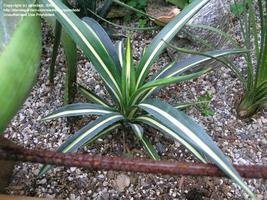 There is the marginata version with yellow striping down the sides of the leaves, and mediopicta with white stripes down the center. 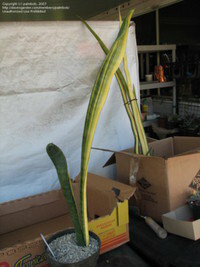 The former is a massive and hardy plant, as huge and aggressive as the normal version, while mediopictas are smaller, and tend to sucker more closely to the parent plant (important if one does not want to deal with constantly removing plants from ones garden). 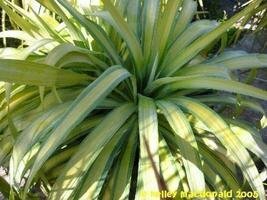 There are also striated versions of this species that are fairly aggressive and sturdy plants- these have variable streaking on the leaves and often produce suckers that ‘revert' back to the non-variegated forms. 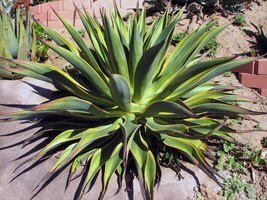 Agave ‘Cornelius' is a fantastic marginal variation that is somewhat monstrose. The reason I like this plant so much is it is very slow to sucker, if at all, so is a much ‘safer' landscape plant... and it stays small as well so fits into most landscaping schemes more easily. 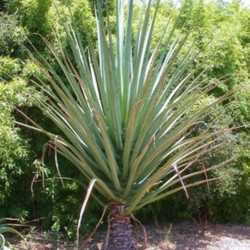 Agave angustifolia is another common landscape plant and is extremely hardy and vigorous. This plant is so common that I didn't even realize there was a non-variegated version until I saw some in a botanical garden. The non-variegated versions are probably the natural wild plants and are quite a bit less ornamental, which is probably why they are so rarely grown in cultivation. To me, this is a ‘weed Agave' as it is such a pest in the garden (suckers all over, including dozens of feet from the parent plant). 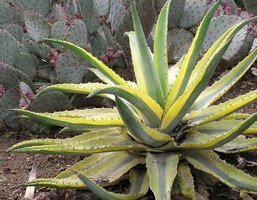 Once established in a garden in the right soil and climate, this plant is nearly impossible to eradicate, so be careful before putting this one on the garden! Agave desmettiana variegata is another common landscape Agave that is far more common than the non-variegated versions of this plant (I had a hard time finding a non-variegated version, and again, was not even aware such a thing existed until seeing some at a botanical garden). This is a very easy plant to grow and suckers profusely... but thankfully most of the suckers are from the base of the mother plant making them a tad easier to manage (some see this as a disadvantage as they are then harder to get at... but less invasive!). And most varieties of this agave have minimal marginal teeth (still a nasty terminal spine) making them fairly safe and easy to prune. 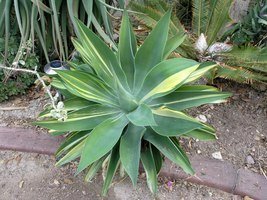 Agave lophantha is a ‘naturally' though subtly variegated Agave with medio-varigeation down the center of the leaves of a paler green than the rest of the dark green leaf. 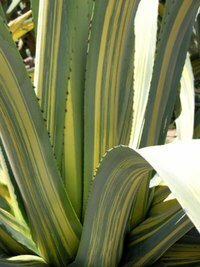 Several other Agaves have this same variegation though a bit more subtle (Agave difformis and nizandensis along with several other even rarer species). 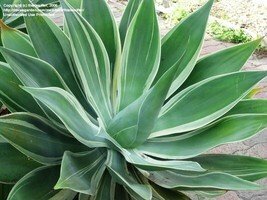 This is probably the most common of these agaves though telling them apart is not all that easy. 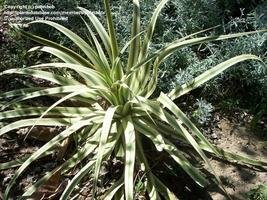 All are vicious plants with lethal spines at the tips of the dagger-like stiff leaves and extremely sharp, hooked spines along the leaf margins. 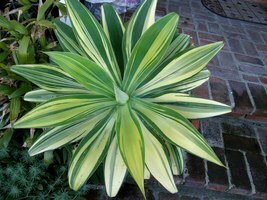 There is a wonderful variegated form of this already variegated plant with marginate-variegation of bright yellow that is often grown in cultivation. These tend to be a bit pricey. They are NOT as hardy as the normal coloration and do not do well in full sun (found that out the hard way). 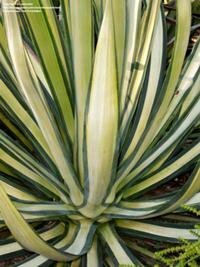 Agave parryi var pattonii Crème Stripe are popular dwarf agaves with striking irregular marginate-variegation of white. 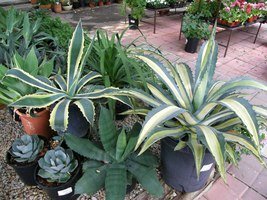 These are also sort of pricey, but are easy and strong plants tolerating full sun easily and they stay very small and are slow to offset making them wonder potted plants. 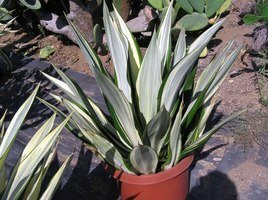 Agave potatorum ‘Kichiokan' comes in several various degrees of variegation and are popular show plants as large ones take a long time to grow and are impressive specimens. 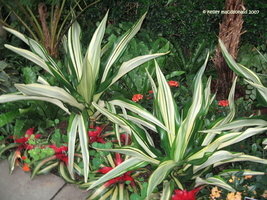 These are subtly variegated plants with a lighter green mediopictate variegation on a blue-green leaf. 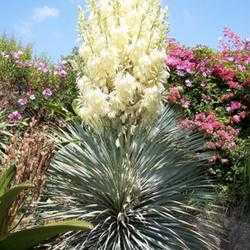 Some have some white streaking at well, and there is a lot of variation with this form of Agave potatorum, itself and extremely variable species. 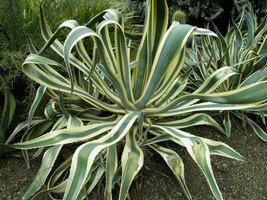 There are number of Agaves that have ‘natural' white variegation where the leaves overlap as they are forming: Agave parviflora, shidigera, toumeyana, victoriae-reginae and ferdinand-regis (probably the same species as victoriae-reginae). These are some of the few natural variegated succulents with this degree of striking variegation. This variegation almost looks like it could be scraped off as it looks like it's been drawn on. 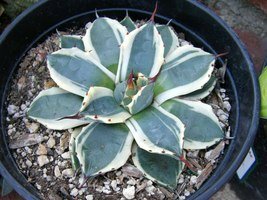 Agave victoriae-reginae is the most impressively variegated of these plants with wide painted stripes across its leaves in a non-geometric shape, but repeatable leaf to leaf giving the plant an amazingly artistic look. 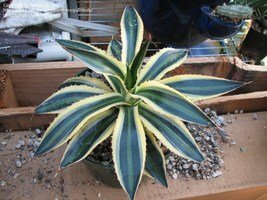 Additionally, Agave victoriae-reginae also comes with additional yellow variegation as well. These plants seem sun hardy and grow just as fast as the normal varieties as I can tell. Hot, full sun exposure does tend to ‘bleach' this yellow variegation a bit making it less distinct. 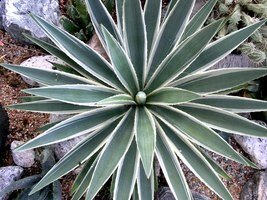 Agave sisilana is commonly grown as a medio-variegated plant that has excellent sun hardiness. 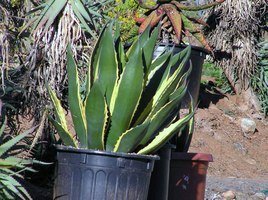 It's cold hardiness seems to be nearly as good as the normal form (neither which are too impressive for Agaves, though, getting damaged in the high 20s if the frosts/freezes are extended). 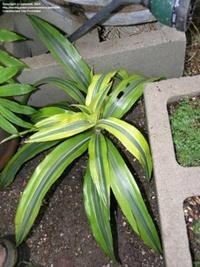 These variegated plants grow significantly slower and stay smaller than the normal forms of this plant, and are much slower to offset (if at all). 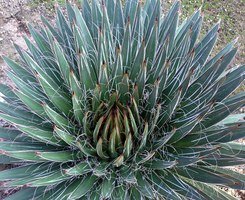 These are nice agaves to prune as they have no marginal teeth to speak of (but careful of the deadly sharp and long terminal spine!). 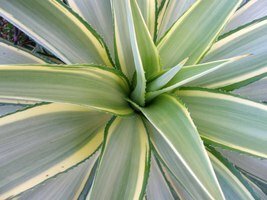 Agave tequiliana ‘Tequila Sunrise' is a popular variegated agave with pale yellow marginate-variegation, though the entire leaf is paler than the original variety. 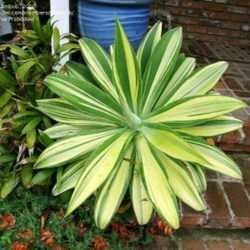 These plants seem quite sun hardy and in fact seem just as aggressive and large-growing as the natural forms. 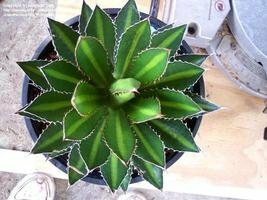 This is a great looking Agave but really only for the largest gardens as it gets pretty large itself and suckers profusely. 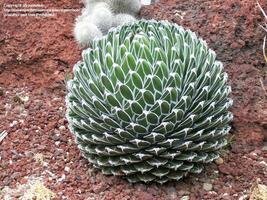 It has tiny marginal teeth and spines but they are SHARP and the teeth easily break off in your flesh, so careful when dealing with this plant. 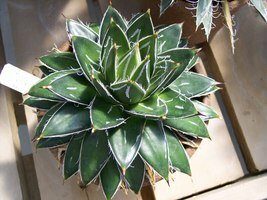 Agave 'Joe Hoak' is a very popular agave in cultivation and has come down significantly in price. 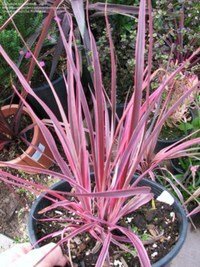 These can even be found at garden outlet centers now for next to nothing and are reliable, sun hardy pale-leaved irregularly marginate-variegated plants. These do offset vigorously which is one reason the price has come down so much in the last 15 years. 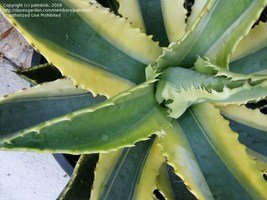 The parentage of this plant is probably Agave desmetiana, but I can find no concrete data... seems to a hybrid created in the Yucatan and originally propagated at a nursery in Florida by Joe Hoak. 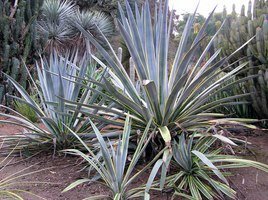 Other related plants to the Agave include a number of variegated Furcraeas, Yuccas, Cordylines and Dracaenas, a Beaucarnea and a majority of the cultivated Sansevierias. 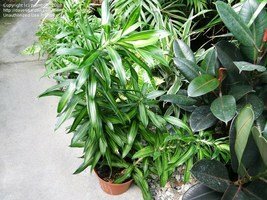 The latter include too many to cover in this article so for some discussion of Sansevierias, see my other article on them (http://davesgarden.com/guides/articles/view/293/ ). 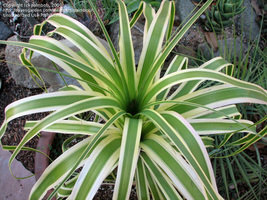 There are a number of variegated Furcraeas in cultivation. 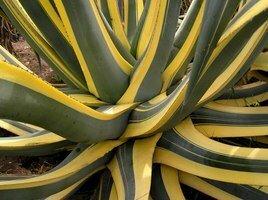 A lot of these look so much like Agaves that most cannot tell them apart. There is an article on Furcraeas in the near future so look out for that one. 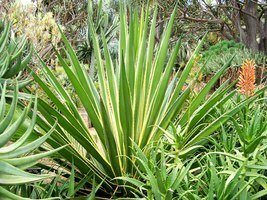 Furcraea foetida Mediopicta is the most commonly grown Furcraea in cultivation and the most user-friendly by far. 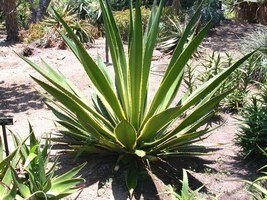 It has large, wide, spineless leaves that are relatively thin compared to a similar sized Agave. 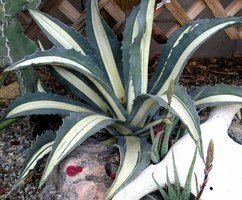 Agave sissilana variegated is often confused with this species, but has much thicker leaves and a deadly terminal spine this plant does not have. Though its leaves are primarily medio-variegated, the streaking and variegation are not always limited to the centers of the leaves and many individuals just have streaks of yellow to white striping in non-symmetric patterns along the lengths of the leaves, often on the outer edges as well as the middles. 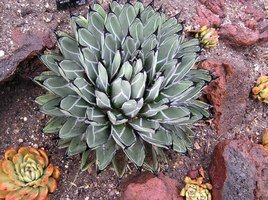 It is an easy landscape plant but suffers in intense, arid sun (another way to tell this one from Agave sissilana variegated) with the variegated parts of the leaves burning badly. 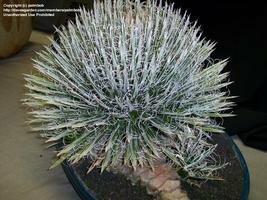 This is probably the smallest of all the Furcraeas and that characteristic, along with its lack of spines and beautiful variegation is probably the reason for its popularity. 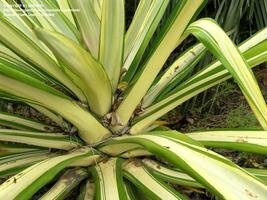 The other commonly grown variegated Furcraea is Furcraea sollea marginata. This is NOT a user-friendly species, not only having a sharp terminal spine, but saw-like teeth along the leaf margins. It is a massive plant nearly 10' or more in diameter and eventually forms a trunk up to 10' tall (usually much less) at which time it flowers and dies. 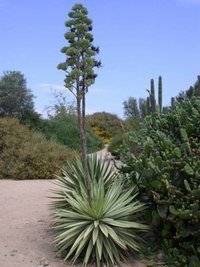 This plant as stiff leaves and looks a lot like a giant agave species (until if flowers and then one can see the difference). 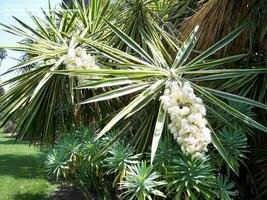 Most Yuccas are not variegated, but a few striking varieties are found in cultiavation. 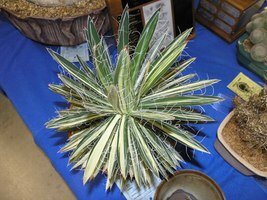 The species that have variegated forms include Yucca aloifolia, Yucca flaccida, Yucca filamentosa, Yucca gloriosa, Yucca guatamalensis and Yucca recurvifolia. 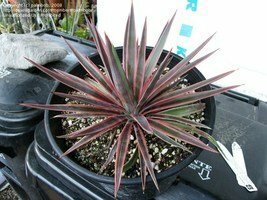 I have grown 3 or 4 of these and they are fairly easy plants for the most part and extremely drought tolerant... yet I still manage to rot a few now and then (from overhead watering). 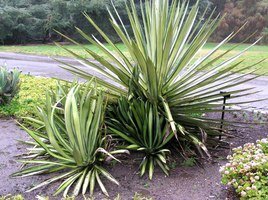 All are fairly user-friendly, droopy or soft-leaved plants with somewhat sharp terminal spines except for Yucca aloifolia- that one is dangerous! I find most of these in my climate look WAY better when I buy them at the nursery than they do from then on (they are stressed or grown in such a way that they are intensely colorful, yet they blanch and the color never returns when I grow them- perhaps these forms need a tad more shade to show color?). 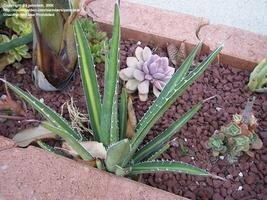 But these plants, as a group, are probably the most cold tolerant of all the Agave-like variegated plants, some tolerating snow even. 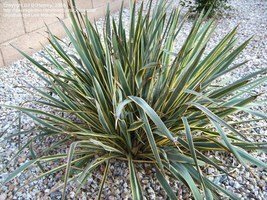 Beaucarnea recurvata variegata (or albomarginata) is one of my favorite variegated succulents- it has beautiful marginate variegation that is amazing sun tolerant. What it is not is cold tolerant, and this form seems especially sensitive to cold (mine died last freeze, though no other Beaucarneas in the yard did, despite most being defoliated). Another sad thing about this variety is it doesn't form the large, typical swollen base the other forms do, but that is presumably because most cultivated plants are cutting/clones from the mother and cuttings often do not form the big bulbs that seed grown plants do. 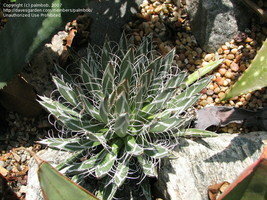 But it still is a beautiful addition to any succulent collection, and a very easy plant to grow. 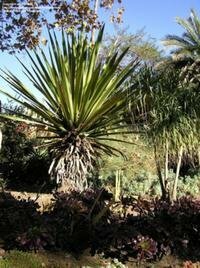 Dracaena is a large variable genus that used to be in the Agave family (but moved to a related family a few years ago) and is succulent-like. 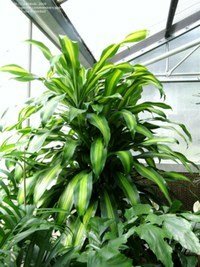 The most commonly grown variegated species include several varieties of Dracaena marginata, fragrans and reflexa. 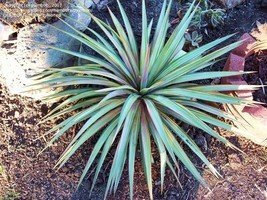 I do not grow too many of these as they are not nearly as drought tolerant or cold tolerant as the above plants and most outdoor plants soon end up in the compost heap. 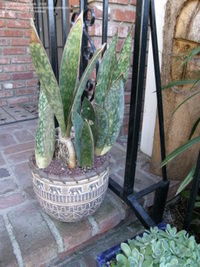 However, most perform splendidly as indoor plants. 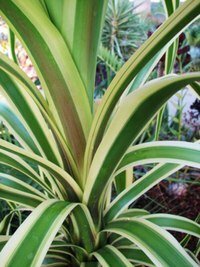 If you live in south Florida, the perfect microclimates in southern California, or Hawaii (or in some other tropical part of the world) you won't have too many problems with these variegated Dracaenas. Dracanaea reflexa variegate (Song of India) is probably the most spectacularly variegated of this genus and is also the most tropical of them all... this one is tough indoors, as well, as it has a low tolerance for low humidity. 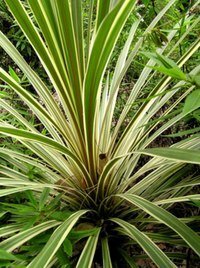 Cordyline, a very closely related genus, though in a different family from Dracaena (it's in the Agavaceae) also has a number of spectacularly variegated species, some quite colorful. 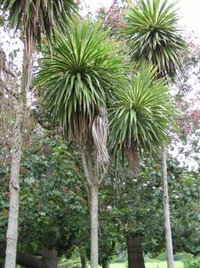 The most well known of these are the Ti plants (Cordylne fruticosa)... but these are not really that succulent-like and definitely not too drought tolerant, so I will discuss those elsewhere. 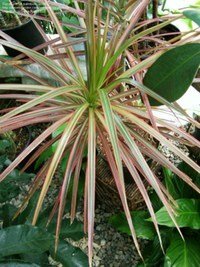 The other Cordyline forms are a bit hardier and easier to grow, but still not what I would call easy (I have killed all the variegated ones I have tried to grow, but I am a careless waterer).